Oscar Elias Biscet is a physician and a prominent advocate for human rights and democracy in Cuba. Dr. Biscet was among 75 dissidents arrested during the Black Spring crackdown in 2003. In a summary judgment for crimes against state security, he was sentenced to twenty-five years in prison. 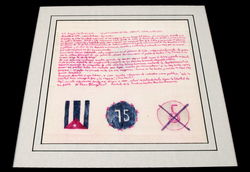 While being held in solitary confinement in a tiny cell, Dr. Biscet created this message on a handkerchief, which was smuggled out of prison. 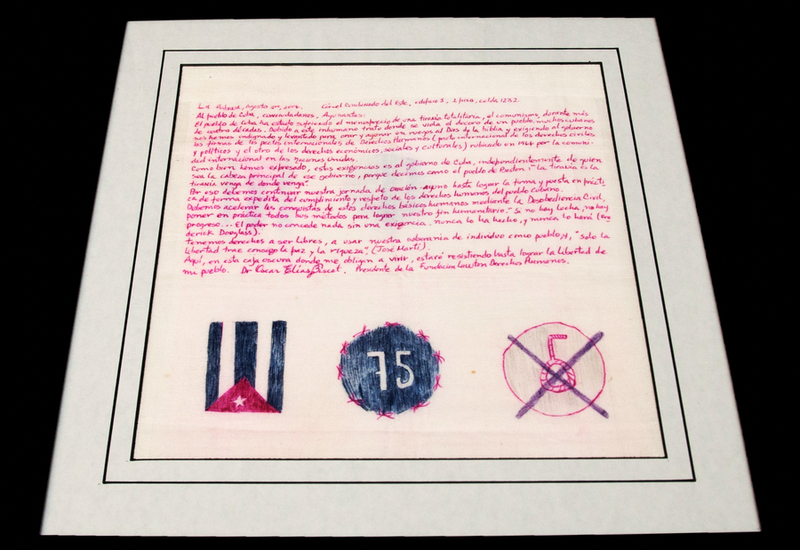 The illustrations at the bottom of the handkerchief include a drawing of the Cuban flag, a reference to the Group of 75 political prisoners arrested in the crackdown, and an image of a noose crossed out to protest the death penalty. He was released from prison in March 2011, after serving almost twelve years under harsh conditions. Dr. Biscet continues his nonviolent activism for change and reform in Cuba. Havana, August 1, 2006 Prison Combinado del Este, Building 1, 2nd floor, cell 1232 To the people of Cuba, fellow citizens, people in fasting – The people of Cuba have been suffering the contempt of a totalitarian tyranny, communism, during more than four decades. Due to this cruel treatment where the honor of the people is violated, many Cubans have become indignant and have risen and joined together to fast and pray to the God of the Bible and demand that the government sign the International Agreements of Human Rights (International Covenant for Civil and Political Rights, and the other for the Economic, Social, and Cultural Rights) created in 1966 by the international community of the United Nations. That’s why we must continue our day of prayer and fasting until the signing is achieved and the practice of respecting the human rights of the people of Cuba is fulfilled. We must speed up the quest for these basic human rights by means of civil disobedience, and by putting into practice all the methods to achieve our humanitarian aims. Here in this dark box where they make me live, I will be resisting until freedom for my people is gained. 1 The quotation is a slogan reportedly used by anti-conscription protesters in colonial Boston. 2 From “An Address on West India Emancipation,” August 3, 1857. 3 From “En los Estados Unidos,” 1902.